What the future of the post “Peak Trump” era holds. 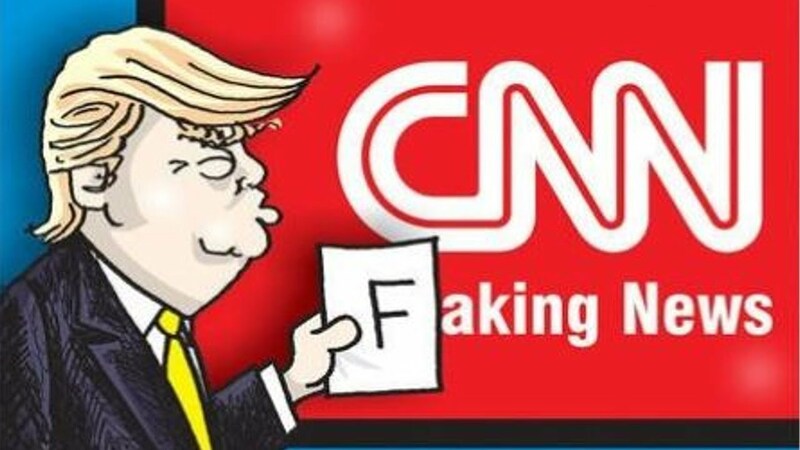 Love it or hate it, the potency of the Trump Administration is on the wane, soon to be stuck in the mire of the Swamp it has deepend instead of drained, while the economy falls into one hell of a recession — so claims former Regan-era Cabinet member and Congressman David Stockman. I have a whole section in the book about how a homeland of defense wouldn’t cost $600 billion that he inherited or now the $700 billion that we have. $720 billion actually, that after two huge Trump increases. Wall Street has been on a roller coaster ride over the last few months. If you listen to the pundits on the financial networks, you’ll hear the word “volatile” used over and over again. That word certainly seems to describe the current state of US stock markets and in a broader sense the economy. But during a recent interview on RT News with Rick Sanchez, Peter Schiff said it’s not that the economy is volatile. It’s actually a bubble. And we are on the verge of a bigger crisis than the one we went through in 2008. Sanchez asked Peter what exactly the Federal Reserve did wrong. Peter said, basically, everything. 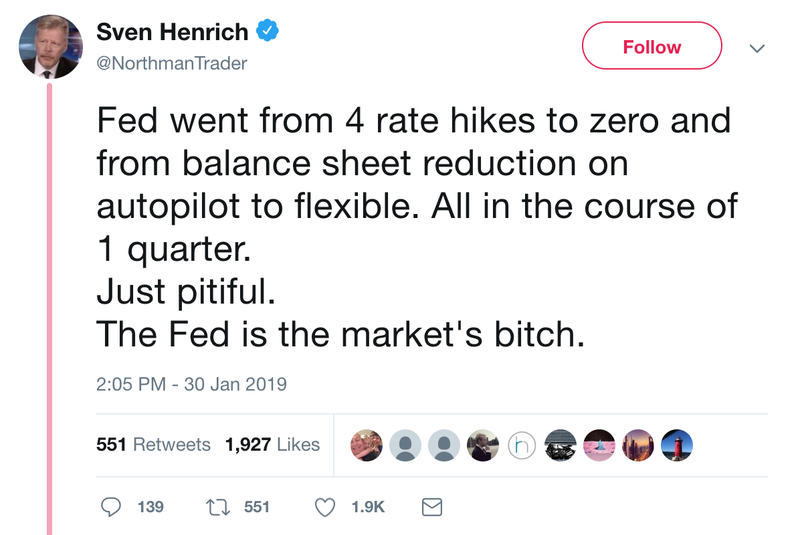 But the biggest things they did wrong were lowering interest rates down to zero, practically, and leaving them there for pretty much the entirety of the Obama presidency. And then they’ve barely raised them. They’re still at 2%, which is very low. They also did all the quantitative easing where they printed a bunch of money and bought US government bonds and mortgage bonds. That enabled the housing bubble to reflate, and that enabled the US government to go much deeper into debt. So, the government didn’t cut spending, which is what we needed. They increased spending. But it also enabled corporations to lever up and buy stocks. So we offer to you, today, a peek behind our premium subscription curtain. The people who subscribe to our work do so to make themselves more resilient, as well as to support Peak Prosperity financially as we carry on our mission of “Creating a world worth inheriting”, which invoves bringing difficult messages to reluctant audiences. Here in the brief period between Christmas and New year’s, as a writer I am obligated to say happy, wishful things. I have to confess, I’m just not feeling it this year, so I’ll just do the minimum here and return to being a curmudgeon, because that’s what the times call for. So, happy new year. I hope everything works out well for you in 2019. There, with that behind us we can now return our attention to the true state of the world, which is deteriorating and getting worse. For most people things will be decidedly worse, not better, as things progress along their current trajectories. The only planet we’ve got to live on is being killed by human activity and gross inattention, while economically the greatest and most ill-advised credit bubble in all of human history flirts with the sort of sudden disaster that follows shortly after the failure of one’s reserve parachute. As I’ve often repeated, I truly wish this weren’t the case. I don’t have a “bummer gene” that relishes bad news nor do I enjoy being “that guy” who says what no one wants to hear. But collapsing insect populations, species loss, shrinking aquifers, and the utter betrayal of the younger generations by the “olders” running the fiscal and monetary policies of the world are not as easily dismissed. There’s no relief at the end of the day when the problem drives itself home. Trouble is, the correlation of changes in the Fed’s balance sheet to changes in asset prices are unambiguous that Powell is either unwittingly wrong or, more likely, knowingly collapsing an asset bubble that was in large part created by the Federal Reserve itself. To set the table, the chart below shows the total Federal Reserve holdings of US Treasury’s (blue line) and weekly changes (yellow columns) from 2003 to present. The August ’07 through January ’09 period is noteworthy as the only period with a like Treasury holding drawdown to what we are presently witnessing. The subsequent highlighted areas show the periods of no growth in Treasury holdings, or most recently the outright declines. The most recent period represents just $230 billion reduction of a proposed $1 trillion total “normalization” in Treasury holdings. Perhaps the reason equities tanked when Powell suggested that the Fed’s plan to normalize its balance sheet was on “auto-pilot” can be seen in the chart below. Red line is the Wilshire 5000 (representing all publicly traded US equities) and yellow columns are the weekly change in the Federal Reserve’s holdings of Treasury’s. On the five occasions (highlighted again) since 2007 that the Fed has ceased buying or outright sold Treasury’s, the Wilshire has gone into convulsions or outright cracked lower. 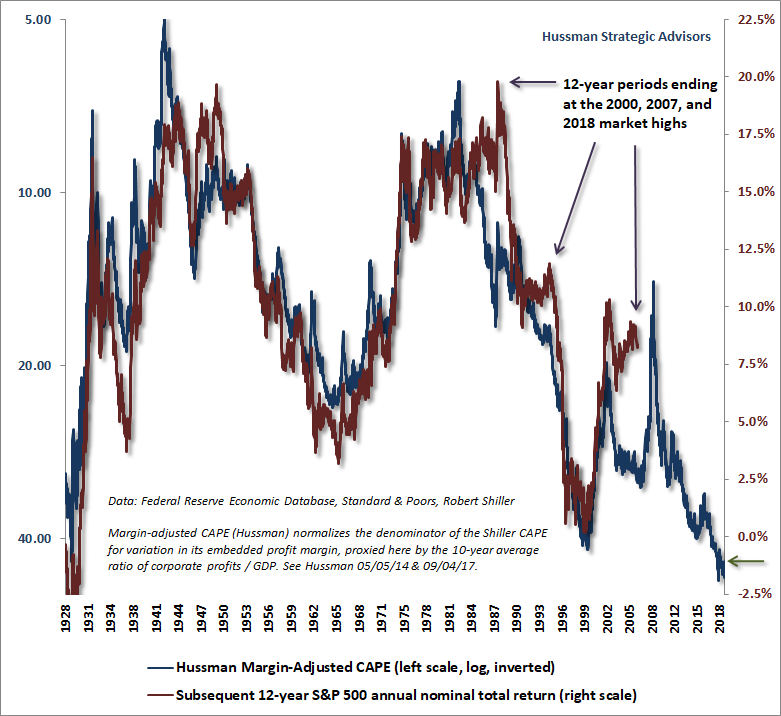 Every December, I write a Year in Reviewref 1 that’s first posted on Chris Martenson & Adam Taggart’s website Peak Prosperityref 2 and later at ZeroHedge.ref 3 This is my tenth, although informal versions go back further. It always presents a host of challenging questions like, “Why the hell do I do this?” Is it because I am deeply conflicted for being a misogynist with sexual contempt—both products of the systemic normalization of toxic masculinity perpetuated by an oppressively patriarchal societal structure? No. That’s just crazy talk. More likely, narcissism and need for e-permanence deeply buried in my lizard brain demands surges of dopamine, the neurotransmitter that drives kings to conquer new lands, Jeff Bezos to make even more money, and Harvey Weinstein to do whatever that perv does. The readership has held up so far. Larry Summers said he “finished the first half.” Even as a fib that’s a dopamine cha-ching. 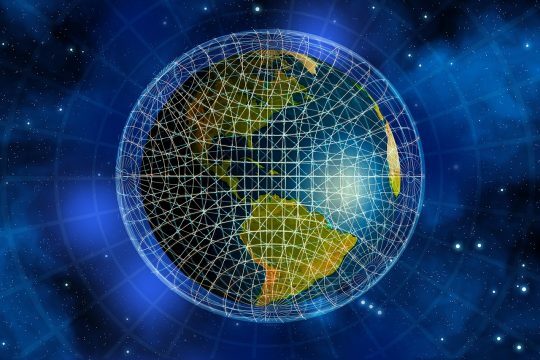 Now that the world’s central banking cartel is taking a long-overdue pause from printing money and handing it to the wealthy elite, the collection of asset price bubbles nested within the Everything Bubble are starting to burst. The cartel (especially the ECB and the Fed) is hoping it can gently deflate these bubbles it created, but that’s a fantasy. Bubbles always burst badly; it’s their nature to do so. Economic suffering and misery always accompany their termination. It’s said that “every bubble is in search of a pin”. History certainly shows they always manage to find one. History also shows that after the puncturing, pundits obsess over what precise pin triggered it, as if that matters. It doesn’t, because ’cause’ of a bubble’s bursting can be anything. It can be a wayward comment by a finance minister, otherwise innocuous at any other time, that spooks a critical European bond market at exactly the right (wrong?) moment, triggering a runaway cascade. Or it might be the routine bankruptcy of a small company that unexpectedly exposes an under-hedged counterparty, thereby setting off a chain reaction across the corporate bond market before the contagion quickly spreads into other key elements of the financial system. Or perhaps it will be the US Justice Department arresting a Chinese technology executive on murky, over-reaching charges to bully an ally into accepting that unilateral US sanctions are to be abided by everyone, regardless of sovereignty. But this has been a quixotic pursuit. Created by pulling tomorrow’s prosperity into today, these asset price bubbles are unsustainable, and invariably suffer violent corrections at their end. So far, the central banks have responded to these corrections by simply doing more of the same, just at greater and greater intensity. 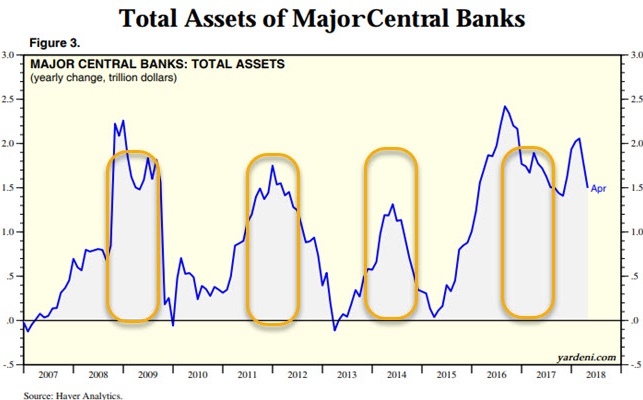 To keep the current Everything Bubble going, the world’s central banks have not only had to more than quintuple their collective balance sheets, but have recently had to resort to the extreme (desperate?) 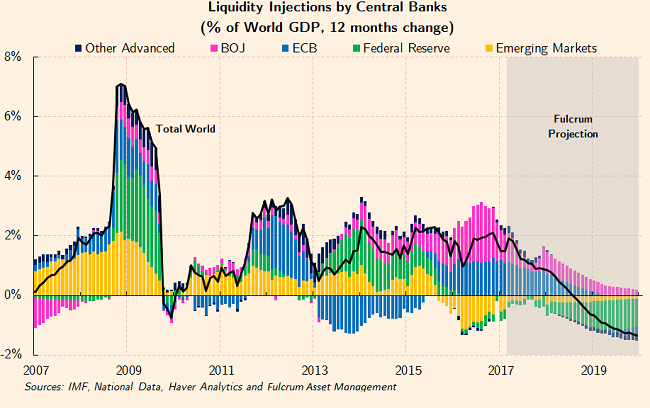 measure of injecting the greatest amount of liquidity ever in 2016 and 2017. History has shown us that the height an asset bubble reaches is proportional to the damage it wreaks when it bursts. Applying this logic, the coming pop of the Everything Bubble will be devastating. Moreover, the primary driver and supporter of asset price appreciation over the past seven years, central bank easing, is now gone. For the first time since the GFC, the collective central bank liquidity injection rate (the solid black line in the below chart) is now net zero. As a consequence, we fully expect yesterday’s capital gains to become tomorrow’s capital losses. What goes up on thin-air money comes down with its removal. Steen Jacobsen, Chief Economist and Chief Investment Officer of Saxo Bank sees economic slowdown ahead. Specifically, his “Four Horseman” indicators: the drivers of economic growth, are all flashing red. I like to make things simple. Right now we have the Four Horsemen: the four drivers of the global economy. They are the quantity of money, which is falling; the price of money, which is rising; the price of energy,which is a tax on consumers and is rising; and globalization/productivity, which is falling. So, if you look at the economy as a black box, I really don’t know what happens inside of it. But I can observe what goes into the black box: it’s these four things. Globalization / productivity, we know that’s all about Trump, trade war and the likes. It’s not exactly improving; it’s actually worsening. As for the quantity of money, a lot of people argue with me that the Central Banks are still expanding their balance sheets, but the fact of the matter is that the QT in terms of the U.S has been reducing the Federal Reserve balance sheet. And we have a stealth reduction of the balance sheet in terms of the Bank of Japan. The EBC would love to cut and is publicly committed to doing so. The Bank of England is doing its first hike. So the quantity of money is falling. The paragraph above captures everything that has happened, is happening, and will happen during this Fourth Turning. It was written over two decades ago, but no one can deny its accuracy regarding our present situation. The spark was a financial crash. The response to the financial crash by the financial and governmental entities, along with their Deep State co-conspirators who created the financial collapse due to their greed and malfeasance, led to the incomprehensible election of Donald Trump, as the deplorables in flyover country evoked revenge upon the corrupt establishment. The chain reaction of unyielding responses by the left and the right accelerates at a breakneck pace, with absolutely no possibility of compromise. A new emergency or winner take all battle seems to be occurring on a weekly basis, with the mid-term elections as the likely trigger for the next phase of this Fourth Turning. Which triggers are driving the action? What’s next? Every week at PeakProsperity.com, we record a podcast exclusive for our premium subscribers titled Off The Cuff, where Chris and a weekly expert discuss the notable developments of the week. Every once in a while, we’ll share one of these episodes with the general public, which we’re doing this week. Here’s Chris Martenson in discussion with Wolf Richter, evaluating the causes and repercussions of last week’s violent drop across the stock and bond markets. Recorded last week as the market was in full melt-down mode, Chris and Wolf Richter decode the underlying drivers of the sudden reversal, and peer into the future to predict what is most likely to happen next. Both agree that, whether stocks are briefly ‘rescued’ in the ensuing days, the long-awaited downward re-pricing of the ‘Everything Bubble’ is nigh. The emerging market stock index is down 22% from January. So they have gotten hit pretty hard. There’s this trend from the outside toward the core. So when something deteriorates, it starts at the outside and moves toward the core, the core being the higher quality US financial instruments. So that’s probably a dynamic that has already started. And I agree with you. The central banks removing liquidity is a big thing, and it has a big impact. And people have said, for years, well, QE didn’t cause stocks to go up. So when that goes away, it’s not going to cause stocks to go down. But that’s just not true. The purpose of QE, as Bernanke himself explained it in a Washington Post editorial in 2010, is to create the wealth effect, to bring asset prices up so that the wealthy feel wealthier and spend more money and then this someone trickles down.